an 11th Annual Spring Concert of Georgian music. some of the Georgian songs we've learned! Georgian singing workshop and party was in January 2019. Join our mailing list and receive notices of upcoming FREE workshops! 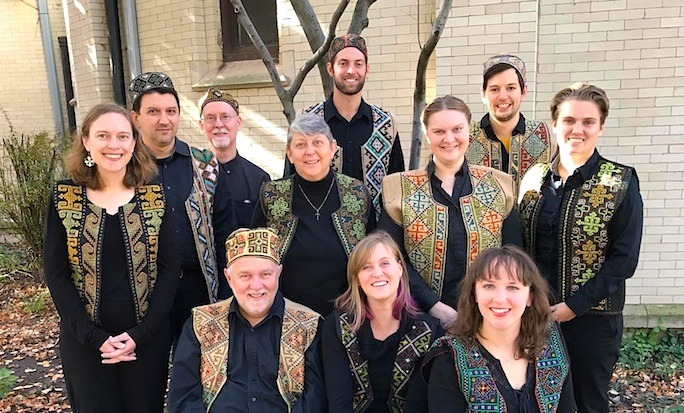 We are inviting existing Georgian ensembles, all interested singers, and curious audience members from throughout the U.S. and beyond to a weekend of workshops and performances in Chicago in June of 2020.
or you would like information about Georgian music performances during the festival weekend then sign up for the Alioni mailing list. More information on Festival2020 will become available later this year. or scroll down for more info. for an immersion event on Georgian music and culture including a concert & singing workshop with Trio Kavkasia! at the 59th Annual UofC Folk Festival. Alioni first participated in the Fest in 2010 and has led workshops many times in the years since then! a FREE Georgian singing workshop and a lively party i﻿﻿n suburban Evanston, IL. Click here -- to discover more about Megobrebi and to learn how YOU can sing with us at the next one! in the Old Irving Park neighborhood of Chicago. This was the 10th annual appearance of Alioni at the ﻿﻿Museum of Science and Industry. a FREE Georgian singing workshop and a lively party i﻿﻿n the North Center neighborhood of Chicago. at the architecturally and acoustically spectacular St J﻿﻿osaphat Parish Church. With special musical guests the V3nto Brass Trio and alumni singers from Alioni's past! Georgian singing is a living folk tradition, which is shared person-to-person. Republic of Georgia. We use your donations to bring Georgian singing teachers to the U.S.
and, when possible, Alioni makes the long journey to learn in Caucasus Georgia. traditional music and to share the excitement of singing together. We also perform these spectacular Georgian songs in concert to the delight of our audiences! Visit the Donations page now -- Click Here! Ensemble Alioni is a 501(c)(3) non-profit organization. You make it possible to keep the teaching and singing of Georgian music alive. We are grateful for your donation of any size! Click HERE to go back to the top. Donations to Ensemble Alioni are tax-deductible to the fullest extent of the law. Alioni logo & Alilo-CD art - Sarah Abram. Colorful Characters CD art - Cullen Parr. Site photos - by Ensemble Alioni. copyright © 2011-2019 by Ensemble Alioni. All Rights Reserved.